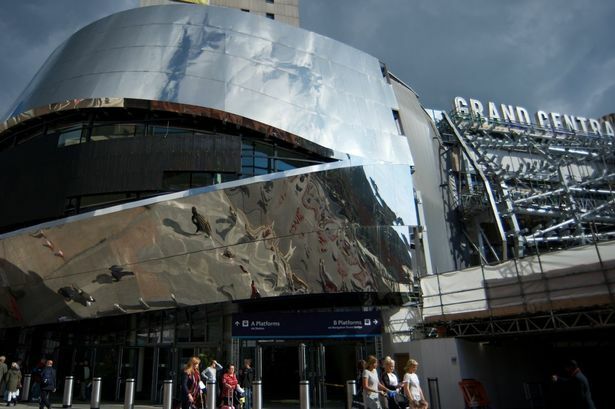 Retail property giant Hammerson has moved to snap up the new Grand Central shopping centre in Birmingham for £335 million. The firm, which is behind the city&apos;s Bullring centre, has exchanged contracts with Birmingham City Council and is in further advanced discussions with other partners to take on a 50 per cent share of the centre. Grand Central, which opened in September, was developed by Network Rail and Birmingham City Council as part of the £750 million New Street Station regeneration project and includes 40 stores and a host of dining units, including a flagship John Lewis. The centre, which cost around £150 million to develop, is sited above the redeveloped New Street station - the busiest train station outside of London, with an annual footfall of 55 million passengers a year. Last year, Hammerson also acquired the Martineau Galleries site around Dale End with a view to carrying out a long-term regeneration of the run-down centre. David Atkins, chief executive of Hammerson, said: "The acquisition of Grand Central, a highly prized trophy asset in the UK&apos;s second city, is fully aligned with Hammerson&apos;s strategy of owning top-performing retail destinations in prime locations. "By deploying our expertise from Bullring, as well as other shopping centres around the UK, Hammerson is well placed to further enhance the consumer offer in Birmingham and achieve high returns through skilful management of Grand Central. "We are strong supporters of the future of Birmingham and this acquisition provides us with additional exposure to the city’s fast growing economy." Birmingham City Council leader John Clancy added: "Hammerson has been a long-standing partner in Birmingham and we are delighted they share our vision for the city. "With the addition of the John Lewis-anchored Grand Central, Birmingham has become the only UK city outside of London boasting the &apos;big six&apos; leading department stores, reinforcing our position as one of the leading national retail destinations." Should Birmingham City Council have retained ownership of Grand Central? Andy Street, managing director of John Lewis, said: "The development of Grand Central is great news for Birmingham and it cements Birmingham&apos;s position as a retail destination of choice. "Our new shop has enjoyed a wonderful reception in the city and, given Hammerson&apos;s proven expertise in managing shopping centres,it can only go from strength to strength. I am delighted to see them take on the ownership of Grand Central."